The Indian Premier League (IPL), India′s biggest cricket extravaganza is continuing its fifth season and will end on 27 May, 2012, with final at Chennai in M. A. Chidambaram Stadium. In the mean time Yahoo! 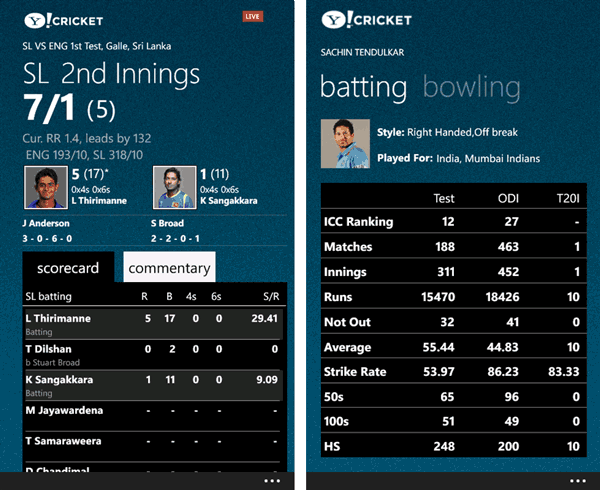 has launched a new cricket app for Windows Phone users in India. The app will show detailed live score and ball-by-ball commentary for IPL matches and all other international cricket matches. Yahoo has already made this app available for iPhone, Android and Nokia phones. In off-time, users can view specially created photo galleries, read all the latest news articles on the game, can browse through results of completed matches, and know schedules of upcoming matches. At any time, users can access all international teams and players profile with the help of the app. Unfortunately I don′t have a Windows Phone, so I could not test it. But majority of commentator on app page are saying that this is really must have app for every cricket fan. Very nice use of Metro UI and pretty much covers everything. For downloading the app visit Windows Marketplace. It is free and compatible with phone version 7.5 or higher.